Prepare chicken wings by cutting off the tips (either toss or use to make broth later); separate wings into two pieces at the joint. Season generously with salt, pepper, and oregano; set aside while preparing the other ingredients. Heat broth and saffron, over low heat, in a small covered saucepan (this releases the yellow color from the saffron which will color the rice beautifully). Heat the oil in a Dutch oven, over medium heat, and brown chicken pieces on all sides, about 8 – 10 minutes; remove, cover, and set aside (they may not be cooked through). Add onions and peppers to Dutch oven and cook until softened, about 5 minutes. Add garlic; cook about 1 minute. Add wine or beer and scrape bottom of pan to remove the brown bits that have stuck onto the pan’s bottom. Add bay leaf, red pepper flakes, rice, and broth with saffron; stir to combine. Bring mixture almost to a boil, then cover and put in oven (or pour into a pretty oven-safe covered casserole). Cook in oven until rice is almost tender, about 25 minutes. 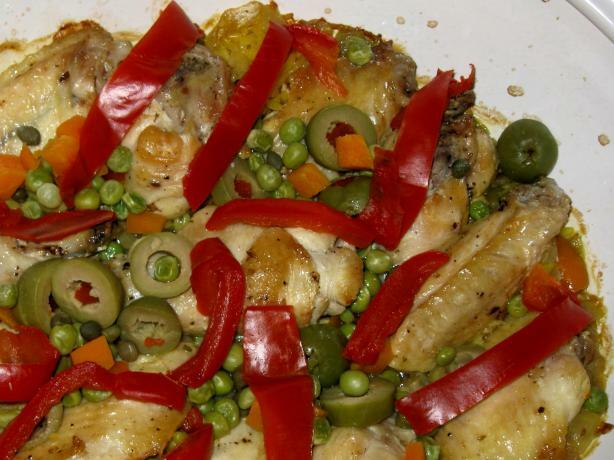 Nestle chicken pieces into the rice; rinse peas and carrots, green olives, and capers in a large strainer and distribute over chicken and rice. Arrange red pepper strips over all, cover, and return to oven until chicken is cooked through and rice is tender, about 10 minutes. I made this delicious dish last night when we had a couple of friends over for dinner. It was a real a real success. Only one change, I used chicken breasts chunked to about an inch in size as thats what I had and fresh peas and carrots from the farmers market. Everyone enjoyed it a lot :D. Made for Culinary Quest 2014. Didn’t anyone ever tell you you’re not supposed to try out new recipes on company? I caught my breath and am so relieved that the dish was well received! It is one of our favorites. My DH made this for us for dinner tonight. It was delicious. We loved the combination of ingredients and flavors. Made for Culinary Quest 2014.